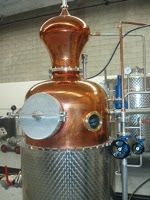 At the end of March, 2009, Still Waters Distillery began production. It took a great deal of work (and, in the opinion of many of our friends and family, a lack of sanity) to reach that stage. Not only was it a challenging business venture to put together, but we found ourselves as (reluctant) trailblazers in the craft distilling industry in Ontario, Canada. We are the first, and so far, only micro distillery in the province. We succeeded in financing a new business during the worst financial crises in decades. We worked hard to develop hands-on skills to personally distill unique spirits. We managed to work through various legalities at three stages of government (federal, provincial and municipal). We are proud that our first product, our Still Waters Single Malt Vodka, has hit the market with rave reviews! As we continue on our journey, we want to share with you our experiences, knowledge, opinions and news. We will discuss the alcohol beverage industry from the perspective of a supplier as well as a consumer. We will talk about the art and science of distillation. We will share our opinions on the various product categories and even specific products. We will give you an insider's look at the business of product innovation, production, marketing and sales. We wish to engage in dialog with customers, colleagues and those that are curious about any aspect of the alcoholic beverage business. We welcome your comments!